McLean was capped 31 times by the Wallabies between 1974-82 at both fullback and fly-half. Widely regarded as one of Australia's greatest fly-halves, he starred for both the Brothers club and Queensland and also had the honour of leading his country on one occasion - against Fiji in 1980. He notched an impressive 263 points in his Test career and posted his 1000th point for Queensland in his 100th appearance in the final match of Queensland Rugby's centenary year in 1982. 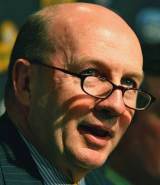 He later served as President of the Australian Rugby Union between 2005-09. He is part of the famous McLean clan that includes his grandfather Doug Snr and uncle Doug Jnr who represented Australia in both rugby codes. His uncle Bill captained the Wallabies in the wake of World War II and uncle Jack toured with the Wallabies in 1946 but did not earn a Test cap. His brother Jeff also represented Australia.